Ok, so it's no secret: i'm a total shoe junkie. Freak. Like, completely obsessed. A total addict. Seriously, ask anyone who's close to me and they'll admit without hesitation that i may have a problem. That being said, i've recently become blissfully infatuated with a very bold hue: red, tangerine, crimson, whatever you wanna call it, i love it. Period. It feels incredibly fresh after wearing darks and neutrals for so long. Plus there's nothing like a pop of color to add flair to your look. Strangely i used to associate bright colors to tackiness, but i'm the first one to change my mind on this type of thing. The ever evolving ideas and ideals in fashion are what keep me fueled with novel inspiration, which is really how fashionistas are constantly able to move forward in their sartorial endeavors. What i'm trying to say is the following: combine two obsessions and the result is one mammoth-proportioned fixation. 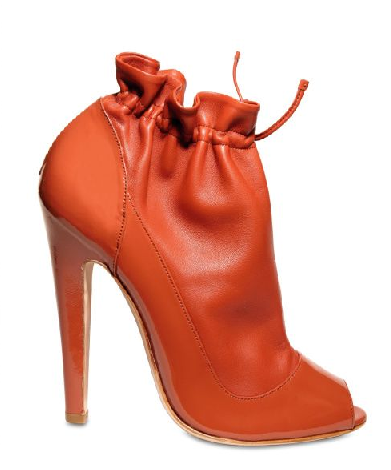 I'm head over heels for the current structure and shape of the YSL shoes. Gah gah!!! oh those YSl's....you should get a pair of red soles! I'm a BIG fan of red shoes! I realized recently why im a bag person and NOT a shoe gal: shoes NEVER fit me properly lol! im not kidding, i have the most difficult feet and NO MATTER WHAT i ALWAYS leave the store with the wrong size lol!! my feet were either swollen when i tried them on and when i get home i need another size, or i'm somehow in between sizes and of course half sizes don't always exist so i end up settling. generally speaking, im an 8. + i have this ridiculous heat intolerance and my skin freaks out and gets all red when it's too hot. it's a recent thing and if it wasnt for it, i would probably be as tanned as i once was. but now i can hardly stay five mins in the sun without turning red...but not burnt...just red! so FRUSTRATING! anyways i think i may have found a cure so maybe then my shoe obsession can establish itself but till then...i guess im strictly a bag gal. bags makes me feel the way i think people feel about shoes: if you want to buy something a shoe always fits and it's an instant pick me up. i feel that way about bags since shoes def. don't always fit me. I am however saving for a pair of Lanvin flats for the summer. i think im gonna go for it and get them this year and i think it will be a great purchase as they look to be the perfect shape/comfort for my difficult feet lol!